I think that monogamy is artificial. I do not think it’s something that comes naturally to us. Yep, that's Tom Ford*, source of all wisdom. Whether it is true for human relationships is outside of our subject matter, but I can certainly relate when it comes to fragrance. I already have a holy grail fig scent, Diptyque Philosykos, and I must talk about it more than I realize because several people mentioned in the comments recently that they thought of it as my signature fragrance. But the road of monogamy is long and hard, and when a new fig fragrance is launched, you can bet I want to try it. If it's reasonably priced, all the better. 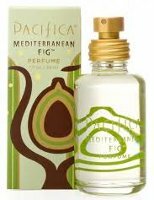 Pacifica's new Mediterranean Fig caught my eye right away. The notes include sweet fig, palm, cyclamen and sandalwood, and it runs just $19.95 for 36 ml. Mediterranean Fig starts out sweet, juicy and fruity, with a touch of sparkling citrus in the opening. It is green, but not so green as Philosykos. Once the top notes are over and gone, it isn't quite so figgy as Philosykos either: it smells more like a blended light floral with lots of fig, and the heavy tree bark and warm earth notes of Philosykos are replaced here with paler, creamier woods and just a touch of earthiness. There is a little hint of warm spice, but Mediterranean Fig is a comparatively clean scent. It is very nicely done, and certainly a bargain for the price. Personally I much prefer Philosykos, or even Body Time's really green and figgy Green Fig oil (which I keep meaning to buy in a body lotion for layering**), but if Philosykos had too much wood and dirt for your tastes and the Body Time was too aggressively green, Mediterranean Fig might be perfect. To my nose, Pacifica Mediterranean Fig is equally suitable for men or women. The lasting power is good for an Eau de Toilette, which is what I assume it is (the website does not specify). For buying information, see the listing for Pacifica under Perfume Houses. * Tom Ford quote via nymag. ** If you've ever had Body Time custom scent a lotion for you, please comment — I'd love to know how it turned out. Update: I did finally buy a Body Time lotion custom-scented with Green Fig, and it's wonderful. I have a Body Time Sea Aloe lotion in Green Fig! It's great…goes perfectly with my Philosykos, in fact. I haven't ordered from Body Time in ages, but I believe the Sea Aloe is their lightest lotion, which makes it just right for use during the humid Michigan summer. It sinks in very quickly and holds the scent well. Speaking of Philosykos, though…you must try the body wash if you haven't already! DianaS at MUA turned me on to it, and it's even nicer than the perfume, I think–earthier, which I love. And has that nifty Diptyque packaging. I hope that Pacifica will do more of their spicy, incense and earthy scents in perfumes. I've had very mixed luck with the throw on the candles, but the scents are wonderful. Oh, that sounds perfect, thanks so much — was worried that the BT lotions might not be heavily scented enough. Wish you did not have to spend $100 to get free shipping though. Haven't tried the Philosykos body wash, but did try the soap and it is fab also. Will look for the body wash! If you want a REALLY earthy soap, try the very spendy FM Vetiver Extraordinaire, it is amazing. Thanks for the review! I've been dying to try this one but my Whole Foods hasn't picked them up yet. Philosykos is one of my summer favorites, and I've been layering it with Bathed & Infused's Green Fig body fluff. It's supposed to be a dupe, but I find it sweeter and soapier than Philosykos. I'm curious, because I know you like fig (and tea): where in all this do you rank Nicolai Fig Tea? How about L'Artisan Primier Figuer (which I prob. just spelled wrong)? Also, if I am falling in love with the CdG Leaves: Tea, is there something wrong with me? You might want to see if you can get a sample of the Body Time Green Fig — they used to sell samples of the oils but don't know if they still do. “Body Fluff” sounds nice though! Fig Tea is great but just doesn't compare to any of these — so much more floral & tea, less fig. It has a totally different feel to me, and I think has had less than glowing reviews because people expected it to be something else. I love it though! The L'Artisan is much drier & less juicy (and way more short lived) than either the Pacifica or Diptyque. The L'Artisan Extreme though is more of a sheer floral with soft fig, kind of milky-creamy in the dry down. The Pacifica probably falls someplace between PF Extreme and Diptyque in terms of figginess & greeness, I'd guess. Believe it or not, Tea was the first CdG I ever tried, and I found it a bit, shall we say, uncompromising — my notes say “would make a great potpourri but would never wear it”. Have only tried it on a test strip since then, but thought it was way cool. Bet I'd wear it happily now! LOL! I so love that quote for perfumes. I can't remotely imagine pledging eternal love to one scent…or even twenty. OK, yes, I do have a core group of scents that I wear for longer periods, but even those change every couple of years. I love the thrill of the hunt and the joy of finding new scents. I'm not a huge fan of fig scents, but, for some reason, I always feel I should be and trust that one day I will see the light. My favorite one so far is PdN's Fig Tea, but that's sort of cheating since on my skin the tea seems more dominant than the fig in that one. The Pacifica sounds like an incredibly refreshing summer scent. I've never tried anything from Body Time, but I don't think a scent could be too aggressively green for me, so will have to search it out. I will definitely try to swing by and pick up some. I adored China Rain back in high school. Dear Tom Ford, I am heartily sick of you and yours. P.S. Sounds like a nice little fig. The “wood and dirt” are my favorite part of Philosykos. I have no idea how you mentally figured out to tie Tom Ford to fig, but I love ya for it, hee! My fave fig is Creation Mathias' very green rindy one, though I can admit to the superiority of the Philosykos composition. That said, have you tried the L'Occitane Eau des Baux line? I don't know if fig is a listed note, but it smells wonderfully figgy to me… of course, it's got it's more “masculine” references of cedar and muskiness (and incense to boot! ), but still, it's quite nicely figgy in the heart somehow. I can't quite wear the fragrance itself, but the ancillary bath products are very fun. Oh, you're nearby, lucky you! PdN Fig Tea is great stuff, and I think more likely to please someone who isn't looking for massive fig. You might like the Green Fig, who knows? It is really more like crushed leaves & stems instead of Philosyko's dirt & branches. LOL — you tell him! The Creation Mathias is gone, right? With the whole line? I liked the opening (it actually reminded me of the Body Time) but on the dry down it got sweeter than I like. Pretty sure I've only tried the L'Occitane on a card, but that I liked it. Why don't they ever have samples? I don't know! It's weird! The boutique near us always is willing to give out either handmade samples or packet samples of the bath and body stuff, but never vials of the fragrances… so odd, considering they're otherwise fairly generous. It was nicely packaged too. But the competition among niche lines must be FIERCE these days, there are really too many of them. Once or twice when I've asked for samples of something new, they've said they don't have them but they do have samples of something else (which they happily part with). So they are generous, they just aren't given samples of the new things. Dumb. Request to Pacifica: Please, please, please make a perfume of Tibetan Mountain Temple!! Thanks for letting me get that off my chest….lol. I actually think (and this is my personal opinion) that Pacifica's Fig is a LOT more spicy, earthy, woodsy than Philosykos. Maybe something is wrong with me, but to me Philosykos is VERY green, clean, fresh with just a hint of woods! It fades away rather quickly and it's definitely a summer fragrance. Pacifica's Fig reminds me of L'Artisan's Premier Figuier a lot. It is “spiced up” and a bit more creamy at the drydown. Philosykos is another story though, so green and light that I almost wouldn't recognize the fig in it. I actually couldn't believe that O Giacobetti created them both: Philosykos and Premier Figuier. So I think that if you enjoy Premier Figuier but the price is too high for your spending limits, try Pacifica's scent. You won't regret! Mediterranean Fig is my favorite of the Pacificas I’ve tried, and the only one I’ve liked enough to actually buy the spray, though Tahitian Gardenia is a close second and I might end up picking that one up too eventually (I have a couple of solids but I don’t wear them all that often.. I think solids just aren’t my thing). I like the creamy woods with the fig. It doesn’t seem particularly green to me. I ordered a sample of Philosykos from LuckyScent, so I’ll find out how it compares pretty soon. I tend to like woody, earthy and green, so I’m excited to try it.